There can't be many of these remaining. The barn find/yard find Porsche is more and more rare every year. The joy is in the hunt, and the hunt becomes more difficult with each unit unearthed. With only a few thousand constructed more than 5 decades ago, this type of find is rapidly becoming as rare as the proverbial hen's tooth. The Porsche was a unique aquamarine color when it left the factory in 1957, and I could see that color contributing to its current bid of over $86,000. The color, however, is where my short list of positive aspects runs dry. This is a car that will legitimately need everything, and these days, everything is expensive. 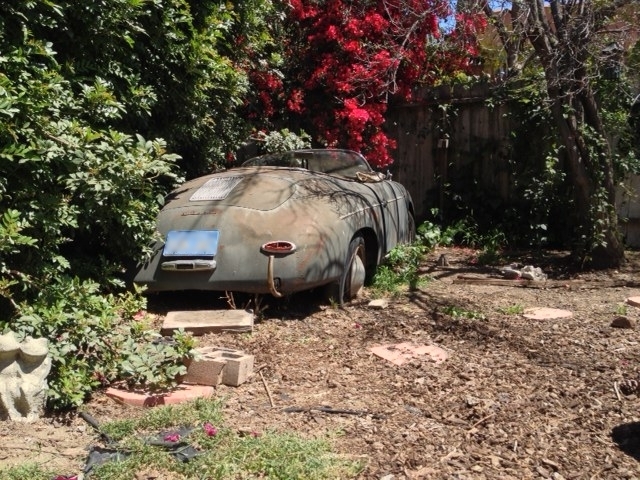 The floor pans need to be replaced, the car does not have a number matching engine (or even an engine at all), The rare speedster seats will need to be replaced or completely rebuilt, and a lot of bodywork will certainly be required. The sale listing describes the speedster as having "Most trim, moldings, emblems, badges and gauges intact", however, I can tell you from experience that it will be infinitely expensive to have each piece refurbished. The bumpers appear to be missing, costing several thousand right from the start to simply replace those. While the value of a good Speedster has certainly gone up in recent years, the price of a bad one has eclipsed what a concours winner would have cost only 6 or 7 years ago. Is this Porsche really worth it? If money were no object, which may be likely for most people considering this car, and you were simply looking for a unique vintage Porsche project, this one might fit the bill. Aquamarine is certainly a gorgeous example of the colors Reutter Karosserie was capable of producing in 1957. Is that enough, though? You can relatively easily find a prospective project with the bones already complete for likely not much additional cash outlay. Is that the point, though? Perhaps you are looking for a project that is from start to finish "yours". If you plan to never sell the car, then you will likely get all of the enjoyment out of it to make it worth the price. If it were mine, I'd spend only what is necessary to make the car solid and safe to drive. Giving the car a thorough going through of the transmission, brakes, pedals and levers, and a fresh engine, this car would be a phenomenal piece of history to enjoy. It would be rough and tumble, showing off it's survivalist history. I would still be able to drive it without feeling nervous about the prospect of rock chips in a freshly painted exterior. I think that this is the only logical path for the next owner to take, as they can continue to enjoy the car without suffering any further depreciation. Without laying out an additional 70 thousand in restoration costs, the Porsche could be enjoyed for what it is at a fraction of that. If you are interested in making it your own, catch the speedster on eBay . Interesting to note that the seller currently has 0% positive feedback. Caveat Emptor, and all that. A car is only worth what someone will pay. With that said, this one is rough, however it does look like the car has solid panels all around. Floors are easy to do, it is when you get into the rest of the body where things get messy. If the car is solid other than floors it can bring some money. With a project like this, you strip off all non-metal parts and then you dip the entire chassis. Until you do that there is no telling what you have. If I had a chance to go back in time, the 356 Speedster and any solid 356 cars would have been a SOLID investment back in the 70s-90’s. A totally perfect Speedster is easily well over $100,000. Standard clean cabriolets are already bringing that money. While it may look like a write off, these cars can be brought back to life and I have seen examples that were worse than this end up looking very nice. Total restoration typically take 1000 hours or more, and these babies in this condition require at least that (don’t ask me how I know). Stateside shop rates being what they are, it might be time to send examples like this overseas for the necessary work, such as sending it to Malaysia. Another option is to send it to Gas Monkey Garage in Texas. They favor the “patina” restoration philosophy and are known for clearcoating and sealing to achieve the rust and chipped paint look. Imagine this hulk with that look. As of now, it has 0 bids and a min. of bid of $1,000.